PETROFLO SYNTHETIC WHEEL & HUB EP 00 LUBRICANT is a semi- synthetic fluid (PAO) lubricant that can be used for the lubrication of truck wheel hub assemblies where minimal leakage is desired, and long service life is essential. PETROFLO SYNTHETIC WHEEL & HUB EP 00 LUBRICANT can help alleviate oil leakage from wheel seals which can damage brake shoes, increase maintenance cost, and affect the overall safety of the unit. PETROFLO SYNTHETIC WHEEL & HUB EP 00 LUBRICANT can be utilized in many types of wheel end systems designed for oil, and many systems using conventional greases. 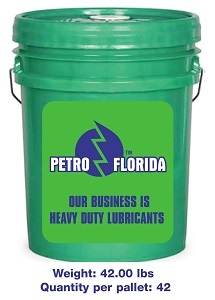 PETROFLO SYNTHETIC WHEEL & HUB EP 00 LUBRICANT is formulated with lithium complex thickener for exceptional service life, synthetic (PAO) base-stock for low and high temperature performance and stability, and is fortified with extreme pressure, and anti-wear additives for extended bearing life. PETROFLO SYNTHETIC WHEEL & HUB EP 00 LUBRICANT, can also be used in certain industrial, quarry, mining or construction applications, where a semi-fluid synthetic lubricant is recommended.